Prophy Rings Prophy Rings make it quick and convenient to do your prophy cleanings. Easily pop in a..
Forerunner of great-tasting prophylaxis paste with a great non-splatter formula and 1.23% APF. Conta..
Dead soft stainless steel with bright silver finish. Preformed to save chair time. 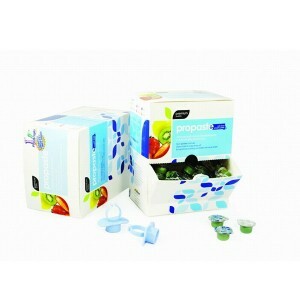 1,000 per package..
Pre-Packaged - 200 sterile cups for individual patients use. Pre-mixed - no messy mixing with water..
200 x paste cups & 2 plastic autoclavable prophy rings .. Smooth, pliable and reduced-splatter formula contains fluoride and a unique blend of cleaning and po..